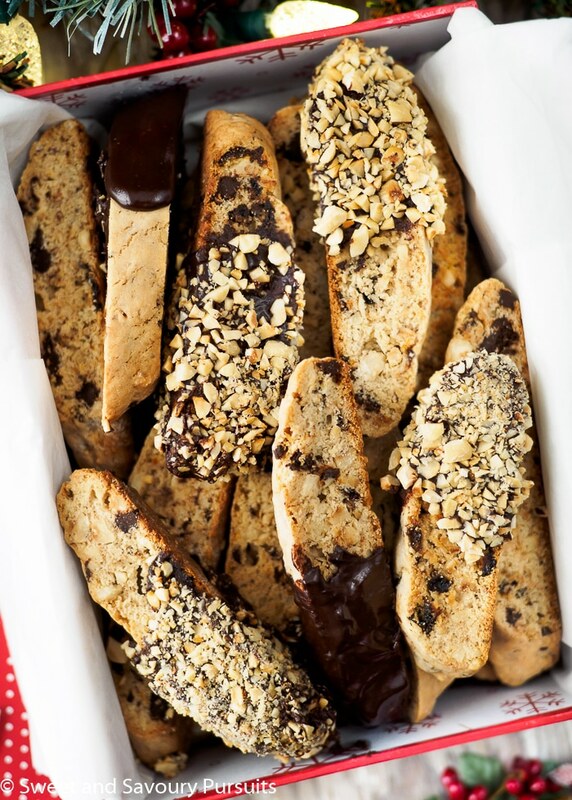 This Hazelnut Chocolate Biscotti is loaded with chunks of chocolate, dried cherries and hazelnut pieces. Keep them plain or dip them in chocolate and chopped hazelnuts for an extra decadent treat! With so many variations possible for biscotti, it can be difficult to decide which ingredients to choose to flavour my biscotti. It’s become somewhat of a tradition, every year around the holidays I take my favourite Pistachio and Cranberry Biscotti recipe and alter the fruit and nut to create a new biscotti as I did with this one. This year, I opted for hazelnut, dark chocolate and dried cherries. I kept the orange flavouring because it goes so well with chocolate, especially during the holiday season. I prefer my biscotti a bit more on the tender side than crunchy, so I bake them for a shorter period of time, if you prefer yours on the crunchier side, you’ll want to bake them for a few minutes longer at the second bake. This recipe keeps very well and can be made ahead and frozen for a few weeks which makes this Hazelnut Chocolate Biscotti ideal for holiday gift giving. Enjoy! Remove enough zest from one large orange to make 1 tablespoon. Set aside. Squeeze the orange to obtain 4 teaspoons of orange juice. In a microwaveable bowl, combine the dried cherries with the orange juice and microwave for about 45 seconds. Set aside. In a medium bowl, whisk together the flour, 1 cup of sugar, baking powder and salt. Set aside. In the bowl of your stand mixer (fitted with the paddle attachment), beat the butter and orange zest with the remaining cup of sugar for about 3 minutes on medium speed until butter is fluffy. Add the vanilla and almond extracts, then the eggs, one at a time beating after each addition. Reduce mixer speed to low and add the dry ingredients, mix on low to combine and then and add the hazelnuts, cherries, and chocolate and mix until the ingredients are incorporated into the batter, do not over beat. Divide the dough into 4 parts. Turn the dough out onto a well-floured surface and knead to combine and shape the dough into a log. Pat the dough so it’s about two inches wide. Place 2 logs onto each lined baking sheet, spacing them 3 inches apart. Bake for 10-12 minutes, rotate the tray and bake for another 10 minutes or until logs are light golden brown and beginning to crack on top. Remove from oven and let cool on sheet for 10 minutes. Lower the oven temperature to 325°F. Using a sharp serrated knife, slice the biscotti logs on a diagonal into ½ to ¾-inch-thick slices. Return the sliced biscotti, cut side down on the baking sheet and bake for 7 to 8 minutes or until pale golden, flip the biscotti and bake for approximately 7 minutes more. Transfer the biscotti onto a rack and let cool completely before serving or storing in an airtight container. If you wish to dip them in chocolate, melt the chocolate in the microwave in 15 second increments, stirring after each time until the chocolate is melted. Once the chocolate is melted, transfer it into a glass or mug to make dipping the biscotti easier. Roll biscotti into the chopped hazelnuts, place them onto the lined baking sheet and let them set before storing. To toast hazelnuts: Pre-heat oven to 350°F. Place hazelnuts on a baking sheet and toast until fragrant and skins begin to blister, about 10 to 15 minutes. Remove from the oven and cover hazelnuts with a kitchen towel. Let steam for about 3 minutes and then vigorously rub the hazelnuts in the towel to remove skins. Let the hazelnuts cool, discard the skins and chop the hazelnuts coarsely. Hi, have you tried eggless biscttis as well? Hi Neha, no I haven’t. I always use eggs in my biscotti recipes. Mmm…. I love biscotti! And you can’t go wrong with chocolate and hazelnuts! These are just gorgeous – perfect to enjoy yourself with a morning cup of coffee or to give as gifts this holiday season. Thanks for the inspiration! Thanks Kathleen, I agree no better match than chocolate and hazelnuts! 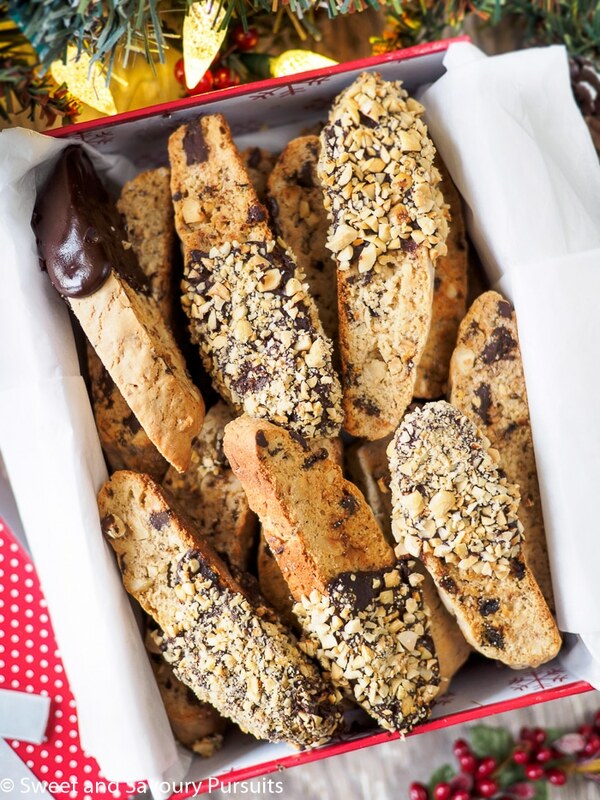 Gorgeous and another great biscotti recipe. You are a master Fida, saved. I don’t know about being a master, but I do love biscotti! Thanks Suzanne! This sounds delicious! I love biscotti! Fida, these look great. You’ve got me inspired to start my Christmas baking. Thanks!